Do you ever feel like your cat has spaces in your home that he owns or that are his territory – a space that he is prepared to defend? Why does your cat feel more comfortable in certain spaces and not others? Why Is My Cat Territorial? In the wild, cats only survive if they are successful hunters, and if they have a safe and secure individual home range and territory. Consequently, cats are usually cautious and concerned about intrusions into their area, especially at certain times such as dawn and dusk. Even if your cat is indoor-only, he still has a strong natural instinct to hunt and establish territories. Your cat is fed on a regular basis and does not have a need to hunt for his food, but due to his natural instinct to establish a territory, your home must provide an environment that meets all of his needs including territorial marking. How Does My Cat Claim His Territory? Usually the area where your cat spends the majority of his time is his territory. To define their territory, cats exhibit natural marking behaviors like scent rubbing and scratching. Your cat marks his scent by rubbing his face and body, which deposits natural pheromones to establish boundaries within which he feels safe and secure. You probably have noticed your cat rubbing up against you, the furniture, and other items in your home. He is scent marking you and these items as part of his territory. Scratching produces both a visible mark and a scent mark which cats use to avoid conflict when sharing space, especially with other cats. Spraying urine can be a problematic marking behavior that your cat may express. Often the method chosen by your cat to scent mark is determined by his emotional state at the time. Contact your veterinarian if your cat is marking its territory by spraying urine. 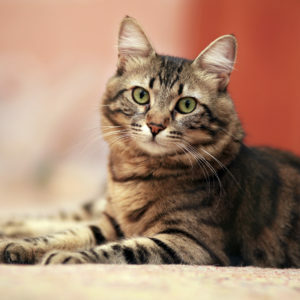 If your cat’s marking behavior is causing a problem in your household, contact your veterinarian to discuss in length. They can offer advise on ways to create a mutually agreeable solution. Often, negative marking behaviors are a sign that your cat does not feel safe. How Does this Affect the Way I Care for My Cat? Make sure that your cat has an enriched environment which allows him to define and engage in the activities associated with all three types of territories listed above. Indoor-only cats especially need areas and items in the household to encourage play, as well as mental and physical stimulation. Such items may include cat trees, climbing areas, and items that allow them to explore such as food puzzles. Cats need an outlet to exhibit natural marking behaviors such as scent rubbing and scratching. You need to provide your cat with suitable scratching areas and alternatives. Some cats like to have access to soft resting places up high where they can observe their territory and feel safe. Just because two cats live in the same home does not mean they are going to get along. Cats are more likely to merely tolerate one another unless they are siblings or from the same social group. To reduce conflict, cats often set-up separate, sometimes overlapping, territories within the home, but may continue to scrap with each other sporadically. Mostly both cats will avoid each other if they can. If your cats have successfully established individual territories and a comfortable way to share common space, you should see very little aggression of conflict. The multi-cat home suggestions below show ways you can help your cats set-up individual territories within the same home. If you have more than one cat, you should feed them in different locations and have several litter boxes available in different locations, away from the food and water stations. Remember that each of your cats need their own set of resources in order to feel safe and secure in your home. These resources should be placed away from high traffic areas and in locations where your cat can get away easily (i.e. not backed into a corner, small room, or end of a hallway). Consider using a pheromone product that can help cats remain calm in a social group or reduce conflict, such as Feliway Multicat. Multi-cat households should also have safe places in each cat’s territory where your cats can retreat to so they feel protected or which can be used as a resting area.